GOD CREATES A NEW WORLD! God wanted to create a new world. He created beings in this world that have one very special ability that even angels do not have. The new human beings, because of the power God chose to give, could choose to create another new being to come into God’s Universe. They could have children. The Bible says that God created our world. It did not "evolve". A Divine Creator chose to speak, and it was done. On the First Day, Genesis says God made light. 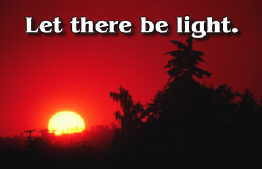 Perhaps there was something special in that "light", for God did not make our Sun until the fourth day. The Bible does not make it clear if at the beginning of "Creation Week" there was a dark earth of rock here (like the moon), or if God created the earth from nothing that first day. Regardless, God was the creator of earth and light. On the Second Day, God created air and firmament (space). The Bible talks about putting space between the waters that were above the land and the waters that were below. [Some Creation scientists today think this may mean that there was some type of an envelope of water around the earth. These scientists feel this water may have come down at the time of the flood.] The Bible gives an interesting clue, but not all the answers. On the Third Day God separated the waters "below the heavens" into sea and dry land. God then started creating the most beautiful trees, ferns, flowers and grass. The dry land filled with the brilliant colors of nature. God made the sun and moon. The plants now had a special source of energy to create the food for man and animals. Some time in Eternity, God made every star, Galaxy and all the other Planets. On the Fifth Day God must have had a wonderful time creating the fish and birds! God made many varieties of fish. God did not design the waters just to be empty, but filled them with billions of living things that move and wiggle! God filled the air with the sound of colorful singing birds! During the first part of the Sixth Day, God must have had fun creating so many different types of animals! His designing hand chose to create animals with long necks to allow them to eat leaves, or tails to swing in the trees. God knew just what was needed to balance everything out in a perfect world where there would be harmony, happiness and love. Then, as the crowning act of his Creation, God made man. 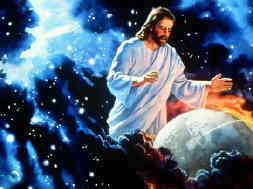 God actually came down, took the elements of the earth in the form of "dust" and formed "man". God breathed into man the "breath of life". This spark of life was like the electricity in a light bulb. The first man, Adam, came to life and looked into His loving Creator’s face. Adam was not created like a baby, but as a full grown man. Man was given the power to think, to plan, to make decisions. Man was given the power to choose, to worship and to love! The Bible says that God asked Adam to name all the animals. All the animals had partners, for they were male and female. As Adam was naming the animals, Adam came to realize that He was alone. So, God performed another creation miracle. God put Adam into a very deep sleep and took a rib out of him. From that rib, God formed a female – a beautiful companion just for Adam! Think of the joy Adam felt when he first looked into the beautiful eyes of the woman (Eve) actually made from his own body. It must have been ‘love at first sight’! 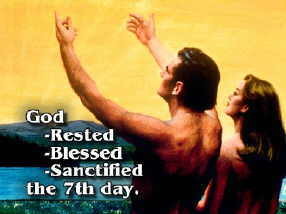 God created the Sabbath: At sunset that Friday evening, the seventh day Sabbath began. God came down and talked with Adam and Eve. God explained that each seventh day was sacred time and should be kept holy. The Sabbath was to be a time when man turned from daily activities, and talked with God. The Sabbath would give man time to worship, study and pray. The seventh day Sabbath was always to be a memorial of Creation.. The Sabbath was to be like a safety net, constantly pulling man's thoughts and loyalties back in love to his Creator. The seventh day would always be a memorial of God’s Creative power and Lordship of man's life. As man kept the Sabbath week by week, the family would be blessed! [Genesis 2:3]. Creation week was now ended. God was very happy with what He had created! The Bible says that God shared Adam and Eve's joy every evening. God would come down personally and talk with them. Go to the Next Section: Sin Spreads Into Our World and learn about God's Warning!